Saying we love someone can take all our courage, our wisdom, our foolishness. Often we don't know how to say it. When we do get to say we love someone, sometimes we reach for the pitch known as poetry. Of all the art forms, poetry and song relay love most immediately. 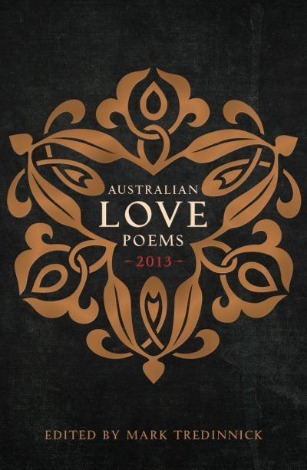 A book of all new work (Australian Love Poems 2013, edited by Mark Tredinnick) shows how poetry can stretch the message to screaming point, or say it all in a few seconds. Poetry allows us to say just how silly we feel or can make of a simple admission, something sublime. what if I said you're all of these. willow trees can not fathom. legs round neck. Clothes over there. Freud was not the first person to advise that eros doesn't last. Relationship is about communication and change, so the poems are arranged to track different states in love's life. Poets talk things through to themselves, yet they talk to us. Poets talk to the one they love, or to us about the one they love, so it can get tricky. Quietly they let us in on secrets, or other times let it all hang out. Reading 200 love poems at once, we start hearing people talking to each other. We wonder if Poet A is actually mad about poet B, if Poet Y wants to take Poet Z to Paradise, or dearly wishes them in the other place. The book sets up such connections and moods. Anthologies reflect the character of their anthologists. This book was shaped by someone who knows first loves and losses, resolutions and fresh starts. He likes the variety of forms, favouring clear expression, strong images, and striking analogies. Tredinnick has cited Hafiz and the Sufi tradition as a guiding principle in creating the collection. Are Australians Persians? To judge by the evidence of this book they are more forthcoming than might be assumed, at speaking of love. Trademark laconic is there, but also a delight in syntactical play and unexpected words. Gender and orientation are not issues, even if relationships are. Shyness and bluster live as neighbours with bubbliness and raunch, but then also melancholy and regret. Survival, like love found, is a good in itself. There is an intelligence at work frequently in the use of allegory and trope that is almost courtly. But one conclusion is certain: when 632 Australians submit 1501 new love poems to a tight deadline, it has to be said, they're up for it. Philip Harvey is the poetry editor of Eureka Street. He maintains a word study site, a poetry readings site and a workplace blogspot. Recent articles by Philip Harvey. Something technology can never replace - the physical and tangible joy of holding a poetry book. I am a frequenter of bookshops, sometimes at airports. Recently, we were travelling interstate and I selected a poetry book at an airport bookstore. The assistant gave me a big smile and said, "Unusual choice". I said "You don't sell much poetry?". "Alas, no" was the reply. I guess The Australian Financial Review pays their rent. I hope Mark Tredinnick's collection sells well - there'd be lots more interesting conversations in airport bookstores! That's a lovely thoughtful piece of writing. How refreshing to read a piece about poetry that makes you think of the music of language and not the ego of poets; and how doubly refreshing to read your best poet Paul Kelly. Peter, thanks for this delightful piece. I'm out of the country at the moment, but I'll be heading for a bookshop to get this as soon as I get back. Thank you so much. This is a great collection. Loved seeing Michael Sharkey's contribution A great gift awaits . . . In a city riven by violent hatred between Catholic and Protestant, non-religious and charismatic music lover Terri Hooley managed to stand outside and above the conflict. He became a kind of rickety prophet to Belfast's disaffected youth, as godfather of the city's burgeoning punk music scene. If any community had a reason to embrace the rage and unity of punk culture, it was Terri Hooley's Belfast. Behind, the cliffs are already in shadow. But the sun falls on this calm place, the sun falls still on these untroubled waters.